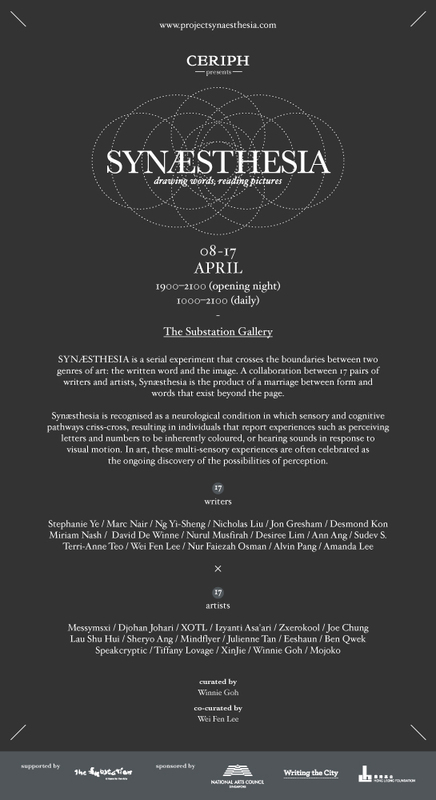 One of my poems is featured at SYNÆSTHESIA: Drawing Words, Reading Pictures, alongside the work of Singaporean artist-designer Lau Shu Hui. The exhibition, curated by Ceriph, is currently showing at the Substation. Visit www.projectsynaesthesia.com for more. This entry was posted in News and tagged Ceriph, Lau Shu Hui, Miriam Nash, Poetry Singapore, SYNÆSTHESIA. Bookmark the permalink.